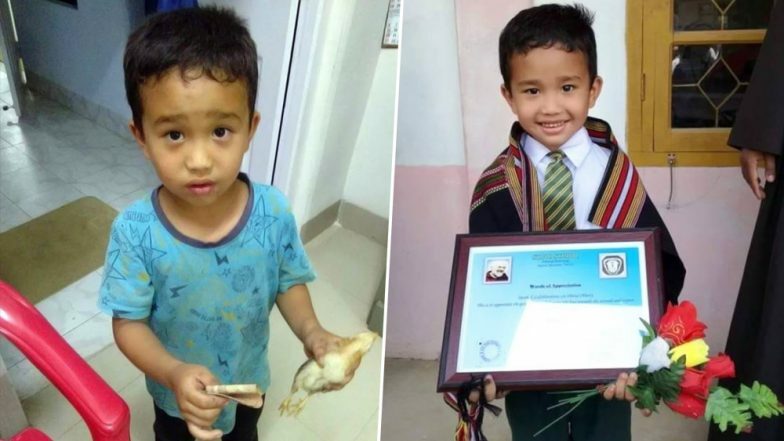 Well-deserved, the Mizoram boy aka Derek C Lachhanhima who mistakenly ran cycle over a chicken and took it to the hospital with all the money he had, has now received an award from his school for his good deed. The news has brought smiles across nations, and an image of Derek C Lachhanhima's holding the award is winning hearts. The innocent soul had rushed a hurt chick to the hospital after he realised that he had hit the little animal. However, his school, St Pio, Sairang in Aizawl district, planned to award him a certificate of appreciation on Thursday following his act of kindness at Sairang of taking an injured chick to the hospital with whatever money he had with him. In the world where adults don't even care about bleeding humans on the road, little Derek C Lachhanhima has set an example for all of us. The story was posted on Facebook by a user called ‘Sanga Says’ on Tuesday, and it is going viral ever since. Sanga Says' caption read: "As per Reports: This young boy from Sairang, Mizoram, accidentally ran over his neighbour's chicken with his cycle. He took the chicken, ran to the nearest hospital and with all the money he had, asked for help.I'm laughing and crying all at the same time.)" We agree, the picture does bring tears of joy in the first glance. Mizoram Boy Mistakenly Ran Cycle Over Chicken and Took It to Hospital With All the Money He Had; His Viral Pic Will Melt Your Heart. However, now that he has received an award not only Derek but all of us are happy for the deserving little boy. We hope more and more adults learn from this little angel Derek C Lachhanhima to love people and animals. Any act of kindness never goes in vain.